"Become a great European nation in the empire´s age and discover the new world"
Go back to the age of empires around years between 1500 and 1850 after Christ and discover the most impressing empires in the new world. Age of Empires 3 is a strategy game in real time, which allows choosing from 8 nations (France, Spain, Germany, The Netherlands, etc.) in the elder European continent. There are 2 modes you can select in the game. You can play the Campaign mode and become Morgan Black and his relatives, who have to face missions to help the Aztecans fight against Spanish conquerors, confront France against the British Empire in the seven years’ war, and help Simon Bolivar leading revolutions in South America. The multiplayer mode will enable you to play with friends online and take quick matches (battles). A new feature in version 3 is the metropolis of the European nation you have chosen, which will become more powerful and imposing as long as you play good matches. It will send you economic and military support for your missions. 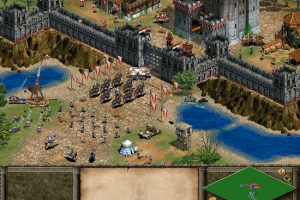 Age of Empires 3 has been improved in many aspects, featuring the possibility of playing in real time. You can enjoy highlighting visual enhancements with the best graphics and effects seen on the game´s series. Age of Empires 3 is a great idea made a game.